Roddy rubbishes Cork boss Dunne as "a boy doing a man’s job"
Collins’ outburst comes ahead of this weekend’s league game between Monaghan United and Cork City at Turner’s Cross. Collins, right, addresses the media while manager of Cork City last season (file photo). 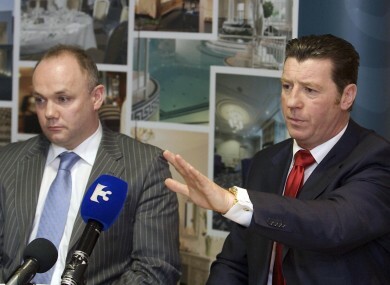 WHEREVER RODDY COLLINS goes, controversy is rarely a million miles away. The surprising attack on Dunne appears to stem from some ill-will which exists between the pair since the former Shamrock Rovers defender stepped in to the Turner’s Cross hotseat in February 2010. Though Collins had been in charge at City for a two-month period prior to the club’s winding-up in early 2010, he was overlooked by the reborn FORAS Cork City FC who instead opted to promote Dunne from his position as the side’s assistant manager. Collins, who claims to have given up his post at Maltese side Floriana to take over at Cork, remained out of work for almost a year until he was appointed by Monaghan United shortly before the start of the 2011 season. Cork are a good unit. They have a great set-up, fantastic training facilities, a big catchment area and a fine squad. But unfortunately they have a boy doing a man’s job as their manager. The job is too big for him and that will prove itself. He was only an understudy to me. It’s a pity, because it’s a massive club. It’s a Premier Division club, they shouldn’t be down in the First Division. Email “Roddy rubbishes Cork boss Dunne as "a boy doing a man’s job"”. Feedback on “Roddy rubbishes Cork boss Dunne as "a boy doing a man’s job"”.